Who will claim the podiums in PyeongChang? Our predictions for the top prospects and those who could be surprise medalists. Officially, the Russian flag will not rise over any medal podiums at the 2018 Olympic Winter Games in PyeongChang, South Korea. But that does not mean that figure skaters from that country will not make their presence felt at the Games in February — especially in the ladies’ event, where a podium sweep is possible for three who will compete under the Olympic flag as Olympic Athletes from Russia (OAR). Evidence of that possibility came at the Grand Prix Final in Nagoya, Japan, in December, where Russian ladies claimed the top two spots of the podium. And that did not include two-time reigning World champion Evgenia Medvedeva, who missed the competition because of a foot injury, but remains the overwhelming favorite for gold in PyeongChang. Her unbeaten records over the last two seasons — and the numbers — say it must be so. When the 18-year-old from Moscow repeated as World champion last April in Helsinki, she became the first ladies’ competitor to win consecutive global crowns since Michelle Kwan of the U.S. did so in 2000 and 2001. Medvedeva has won every Grand Prix event she entered over the past two seasons, was golden at the 2016 Grand Prix Final, and is a two-time and reigning European champion. Then, there are the numbers. Medvedeva has posted World record scores 11 times in her still young career, and is the current global record holder for the short program (80.85), free program (160.46) and overall total (241.31). A foot injury is always a concern in this sport, and she wisely bowed out of the Grand Prix Final to take the time needed to heal to chase the biggest prize of them all. Though she placed second at Europeans behind her young teammate Alina Zagitova, I believe that Medvedeva — a technical savant with uncommon artistic maturity for a teenager — will find herself on the top step of the podium in South Korea. She is the surest bet to strike gold among the individual skating disciplines at the Olympics. A number of talented junior skaters graduated to the senior level this season, with nobody’s arrival more anticipated than 15-year-old Zagitova, who won everything that mattered in her final season in the junior ranks — most notably, the Junior Grand Prix Final and the World Junior Championships. Her debut season could not have been more audacious. Zagitova was golden at both her Grand Prix events in France and China. Then, in Medvedeva’s absence, she posted a convincing triumph at the Grand Prix Final. In all three competitions, Zagitova found herself trailing after the short program, but proved to be an unstoppable force in the free skate. She capped off her first season in the senior ranks by claiming the Europeans crown over Medvedeva. The precocious teenager might lack the artistic maturity — at least at this point — to match that of Medvedeva. But she proved in Nagoya — and at Russian nationals two weeks later where she crushed the field — that she has a technical arsenal more than worthy of a spot on the Olympic podium. The silver medal in PyeongChang is hers for the taking, and it is safe bet that Zagitova will seize that opportunity. There is something to be said about delivering your best when the stakes are the highest, and while the Grand Prix Final is hardly the Olympics, it is still a major stage for the world’s best. Russia’s Maria Sotskova has posted scores that have improved incrementally throughout this season, which included silver medals at Grand Prix stops in Canada and France, the 2017 Grand Prix Final and Russian nationals. The numbers she produced in Nagoya were all personal bests, offering proof of her ability to step up when it matters the most — and evidence that this is a skater trending in an upward direction as she heads into the Olympics. Less than three points separated the second and fifth-place finishers in Nagoya, meaning a fierce battle for at least the last spot on the podium is a possibility at the Games. Who is best equipped to possibly prevent a medal sweep by Russian skaters? Start with three-time Canadian champion Kaetlyn Osmond, who claimed the bronze medal in Nagoya largely on the back of a strong short program. It has been the competition segment most responsible for her success this season, which earlier included a gold medal at Skate Canada and bronze in France. But the 22-year-old, who is Canada’s top hope for a medal, will need to pair that with a solid free skate to land on the podium at the Olympic Games. Japan might also have a say in who comes home from PyeongChang with a medal, with Skate America winner Satoko Miyahara and Kaori Sakamoto, the runner-up in Lake Placid, the country’s selections as the best hopes to crack the top three. Perhaps the most sentimental choice to win an Olympic medal would be Carolina Kostner, the graceful Italian who is beloved worldwide for her artistic talent. Kostner will be attempting to earn her second Olympic medal as a 31-year-old, and a close fourth-place finish at the Grand Prix Final and a bronze at the European Championships suggests it might be possible. Can he? Will he? Win it all again? In the early days of the 2017-2018 season, Japan’s Yuzuru Hanyu was the man most were predicting would be unchallenged in his quest for a second Olympic title. But after being sidelined by injury in November, it is now questionable how dominant he will be in PyeongChang. Hanyu withdrew from NHK Trophy after suffering a right ankle injury on a quad Lutz in a practice session. In mid-December he withdrew from Japanese nationals, so a lack of competitive outings could play a role in how he performs at the Games. However, this is not the first time Hanyu has been sidelined. He has rebounded from a series of injuries that began in late 2014 and have continued intermittently throughout the last three successive seasons. Each time, he has come back stronger, faster and better than he was before, setting World records in the short and long programs and the combined score. Though his performances have, at times, been up and down the past four years, Hanyu has collected 21 podium finishes, which in itself has to be a record. When he is at his best, he is impossible to beat. Given his intrepid record of returning from injury to win it all, I think Hanyu will still be the man everyone will be chasing in PyeongChang. Spain’s Javier Fernández won Skate Canada Autumn Classic over Hanyu in September, and Internationaux de France six weeks later. Illness kept him out of medal contention at Cup of China and, for the first time in four years, he did not make the Grand Prix Final. But, Fernández is one of only a handful of men who have the component levels to back up his technical arsenal. When he combines the two, he becomes a formidable opponent. 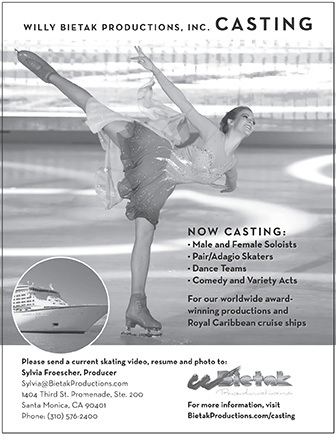 Throughout this season we have seen those with quads falter in competition and the artistic skaters have overtaken them. If that scenario plays out at the Games in February, it could be a trump card for Fernández. All he needs to do is stay on his feet, perform at the level he is capable of and he could be on the podium. With his recent win at the Grand Prix Final in Nagoya, Japan, America’s Nathan Chen put himself firmly in the conversation as a medal contender at the Games. However, we saw Chen crumble under the pressure at 2017 Worlds after winning Four Continents a month earlier. Has he developed the nerves of steel he will most certainly need to compete on the world’s biggest sporting stage later this month? If Hanyu and Fernández are on their A-games, Chen will need a higher level of artistry than he has currently exhibited if he hopes to challenge for gold in PyeongChang. But, if he can remain focused, stay on his feet and execute his solid technical repertoire, he has a very good chance of capturing a medal. What color? If Hanyu is firing on all cylinders, Chen will be in the hunt for silver or bronze. Shoma Uno of Japan has had two fairly successful seasons leading up to the Olympic Winter Games. Though he landed on the podiums at every Grand Prix, Four Continents and World Championships he contested, he won only two events, placing second or third in the other six. At times, his jumps have not been there when he needed them, which has held him back from winning more competitions, as was the case at 2018 Four Continents. Uno, who sits in second in the Season World Rankings, behind Hanyu and ahead of Fernández and Chen, is a developing package — he has the technical skills, but his artistry is also not as solid as that of the top guns. Prior to the Games he was working with Stéphane Lambiel on his presentation but will it be enough? Nonetheless, given his competitive history the past two seasons, he will be in the mix for a medal at the Games. If others falter, he could slide up the totem pole just as he did at the 2017 World Championships. China’s Boyang Jin dealt with injuries in the first half of the season, but came back to win Four Continents so I am definitely including this guy in the mix. He has come through in the past when it counts, particularly at major international events, capturing bronze medals at the 2016 and 2017 World Championships. Like many of the top men, he has a full arsenal of quads, but falls short artistically against the top guns. Jin will also need all his jumps to have any hope of competing for a medal if the top guys are in top form. Russia’s Mikhail Kolyada is a skater on the cusp of success. A third-place finish in his Grand Prix Final debut in December should have been a confidence booster heading into the second half of the season, but a month later he landed in third at Europeans, 15 points behind his just-turned-senior teammate, Dmitri Aliev. Still, Kolyada has solid technical skills and a developing artistic streak, but like Uno, Chen and Jin, he has no experience on the Olympic stage. Kolyada will be a long shot to make the podium in PyeongChang, but I am not counting him out. The pairs competition at the 2018 Olympic Winter Games promises to be one of the most competitive and, given what has transpired this season, it will be of the highest level. All but one of the top teams in the world gathered in Nagoya for the 2017 Grand Prix Final — Vanessa James and Morgan Ciprès of France narrowly missed the cut — which gave us a good insight of what to expect at the Games. Aljona Savchenko and Bruno Massot and Wenjing Sui and Cong Han set themselves apart at the Final and, in my opinion, the battle for gold and silver will be between them. The quality of their elements and programs make those teams the top contenders for the podium in PyeongChang. Interestingly, only one of the four skaters — Savchenko — has been to the Olympics before. This will be her fourth, so she heads into these Games with vast experience. Savchenko and Massot were not a combination everyone believed in at the beginning. However, she is once again in the pole position to compete for an Olympic gold medal, and if this team skates clean in South Korea, nobody can beat them. I predict they will win the gold medal in PyeongChang. I’ll put my money on Sui and Han to take silver. In 2014, they were not selected for the Olympic Winter Games, but now their time has come. This Chinese team is technically strong and have developed as performers, though their programs lack the originality and innovation of those of the German and French teams. However, I predict Sui and Han will be the strongest competitors for the Germans. The field is wide open for the bronze. There are four pairs that will fight for this medal. Technically, Meagan Duhamel and Eric Radford have one of the most difficult programs out there with a side-by-side triple Lutz in both programs and a throw quad Salchow in the free. However, these difficult elements are risky and have not been 100 percent consistent in competition for them. But the Canadians need these elements to set themselves apart from the rest of the field. Evgenia Tarasova and Vladimir Morozov are a young Russian team that has improved a lot and impresses with great throws (including a quad twist) and solid elements. They have meltdowns from time to time, as they did at the 2017 Grand Prix Final, and then rallied two weeks later to win Russian nationals. Their biggest problem, in my opinion, is their unfortunate long program set to Christina Aguilera songs, which does not compare to the programs of the other top teams. It is not Olympic podium material. But, if Tarasova and Morozov skate clean and others make mistakes they will also have a shot at a medal. Vanessa James and Morgan Ciprès are my insider tip for bronze. This French team has improved so much since switching coaches and moving to the U.S. to work with John Zimmerman. However, I think that last year’s long program, “Sound of Silence,” was stronger and more captivating than either of the programs they chose for this season. Their decision to return to this program for the Olympic Games could prove to be a medal-winner. China’s Xiaoyu Yu and Hao Zhang have an outside chance to make the podium. Competing in their second season together they are now jelling as a team. Though their elements are strong, they still are not quite at the components level of the other top teams. Who will dance to the top of the podium at the 2018 Olympic Winter Games is anyone’s guess right now. Canada’s Tessa Virtue and Scott Moir returned to the competitive scene in 2016 after a two-year absence and, in their first season back on the circuit, were unchallenged, winning everything. But the tide began to turn at the 2017 World Championships, where they ranked second in the free dance behind the French team of Gabriella Papadakis and Guillaume Cizeron. The Canadians won the event by a slim 2.58-point margin. This year has been a continuation of that tidal change. At the Grand Prix Final in December the French team won both segments, scoring more than 200 points in total for the third time this season. Even though the score differential between the two teams in the end was 2.30 points, it was yet another confirmation that there is no dominant team in the ice dance discipline heading into the Games. It is interesting that Virtue and Moir twizzled into essentially the same position they were in 2013, when they trained alongside their main rivals, Meryl Davis and Charlie White, and Marina Zoueva coached both teams. This time around, the Canadians train in the same Montréal rink as Papadakis and Cizeron, and both teams are coached by Marie-France Dubrueil, Patrice Lauzon and Romain Haguenauer. However, with equally good programs that could be a gold medal winner on any given day, the playing field is even this time. Virtue and Moir are looking to close out their career with a gold medal at their third and final Olympic Winter Games. The French team is looking to end the lengthy drought of Olympic ice dance champions in their nation. It has been 16 years since Marina Anissina and Gwendal Peizerat captured the ice dance title at the 2002 Olympic Winter Games. Unless something calamitous happens with either of these teams in PyeongChang there is little doubt that one of them will mine gold and the other silver. The battle in ice dance will be for the bronze medal. Three American teams finished within a point of each other at the Final in Nagoya, which bodes well for the U.S.
Maia Shibutani and Alex Shibutani won both their Grand Prix events this season and placed third at the Grand Prix Final, despite landing in last place in the free dance, behind the other two American teams. Madison Hubbell and Zachary Donohue have been on a steady rise the past two seasons. The improvement in their placements and scores in 2017 is an indication that the judges are taking more interest in them. Though this team finished fourth at the Final, they were just 0.60 of a point behind the Shibutanis. Hubbell and Donohue won U.S. nationals three weeks later. Madison Chock and Evan Bates ranked fifth at the Final, finishing 0.85 of a point behind the Shibutanis and 0.25 of a point back of Hubbell and Donohue. All three teams are in the mix for a podium finish. Russia’s Ekaterina Bobrova and Dmitri Solovyev failed to make the Grand Prix Final, but many believe this team was under-marked at their second Grand Prix event in China. That consensus was backed up when the duo subsequently won the Shanghai Trophy and Golden Spin of Zagreb. Bobrova would love to close out her career with an individual Olympic medal, and following their performances at Russian nationals, they are definitely on my radar as an outside shot for a podium finish. Likewise, Anna Cappellini and Luca Lanotte of Italy have the ability to pull off unexpected podium finishes, so I would not count them out. Five teams are in the mix for bronze.